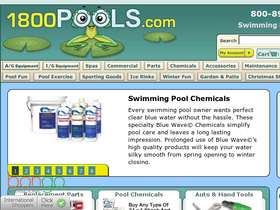 1800Pools, at 1800Pools.com, offers the best swimming pool supplies at your fingertips. The selection at 1800Pools includes above ground pool kits as well as inground kits. If spas are more your thing, check out the portable spas and hot tubs at 1800Pools. For all your swimming pool needs, 1800Pools has it all -- maintenance products, chemicals, pool heaters, pumps, and filters. Before diving into the goods, check out RetailSteal.com for 1800Pools discount codes, 1800Pools coupons, and 1800Pools promotions. 1800Pools ships within the Continental US only and can take as little as 3 days for delivery. Return within 30 days of delivery, with RMA number. See website for more details and exclusions. Use this code at 1800Pools.com and get $50 off your order of $1000 or more. Click link now. Spend $50 or more at 1800Pools.com to get free shipping on your purchase. Click link now to save. Get $25 off of your order of $500 or more at 1800Pools.com with code. Click link now. Use this code at 1800Pools and save 5% on Pond Hockey Goal purchases today. Save $10 on your purchase of $150 or more from 1800Pools. Spend $150 or more at 1800Pools.com and get $10 off when you use this code. Click link now to save. Enjoy a 5% discount on an unsinkable lounge chair when you use our coupon code online at 1800Pools today. Get 8% off when you sign up at 1800Pools.com. Click to save. Save $20 on your 1800Pools purchase when you use this promotional code at checkout! Save $60 on your next 1800Pools purchase when you enter this promotional code at checkout! Save 12% on your 1800Pools pool cover purchase when you enter this promo code at checkout! Shop at National Pool Wholesalers and use our coupon code today to save $2 on your purchase of $75 or more. At National Pool Wholesalers, get $3 off when you spend $75 up to $149 with the coupon code. Click link for savings. Save $40 with the coupon code at National Pool Wholesalers when you spend from $1,200 up to $2,399. Click link to save. Use our coupon code to save $80 on your purchase of $2400 or more at National Pool Wholesalers. Get your complete pool kit from National Pool Wholesalers and they'll send you a free Summer Fun Package.